Home Partners/Links Photo Gallery Contact Us Video Services Privacy & T.O.S. Intrusion detection systems only protect property when they efficiently summon an effective response. Legacy burglar alarm systems, invented and widely sold before the American Civil War, suffer a 98% false alarm rate and result in very few arrests. We offer video based intrusion detection and verification where intrusion videos are delivered directly to private patrol for response, even in challenging environments. With years of experience and proven results, we'll bring the handcuffs! Please connect with us on social media at Youtube, Twitter or Facebook! A construction project in a sketchy neighborhood contacted out Strategic Partners, Ontel Security Services Inc., to protect the project. We installed several wireless cameras that would alert us in real time to any activity. Multiple activations from cameras watching brand new rooftop air conditioners showed a male subject stealing the cameras themselves! As most Bad Guys do when they think there are cameras, he was concealing his face with a ball cap and covering his tattoo with a T-shirt while stealing these cameras. Because the cameras are completely wireless, it's likely he assumed they were dummy cameras. He took them to his house for more careful examination. Unfortunately for him, while he was examining the camera he was also giving us a clear video of his face and a unique tattoo on his arm, now visible because he had removed his shirt. Responding patrolmen were able to identify him walking near the project. He admitted to being on camera but not to stealing them. He was arrested for trespassing and grand theft and turned over to Ceres Police. Silly Bad Guys, Selfies are for Good Guys! Fourth Anniversary of First Arrest! Four years ago our Strategic Partner, Ontel Security Services, Inc., had been hired to secure a bank owned apartment complex in Modesto. The client had a limited budget and limited options because there were no utilities. Thanks to our strategic partnership, Ontel was able to offer the client an option to paying for a full time on-site guard. At various places around the property we hid battery powered cameras that would send videos of activity directly to the computers in Ontel's patrol vehicles. This offered the client affordable protection that vandals were already proving necessary by stealing copper plumbing and appliances inside the property. In the rain and under the cover of darkness to avoid the neighbors being able to watch us install the cameras we set the trap... and waited for it to catch someone. When it did, Ontel Patrolmen quickly arrived and made the arrest- much to the surprise of arrest #1! He had no idea he'd walked right past several cameras or that we'd known he was there long before he'd decided which apartment he was going to break into. For us, this was our first success with this new solution. As it turned out, it would be the first of many! On the third anniversary of the first arrest, three juveniles who were casing a client's property that was sitting empty on the real estate market were arrested- arrests 66, 67 and 68. As we mark the fourth anniversary of our first arrest, we've caused or made arrests of over one hundred criminals, with a ratio of clients to arrests that exceeds the rest of the industry by an incredible margin. We're expanding into new technology and new theaters of operation. This anniversary seems a fitting time to thank, with humility, our Strategic Partners. The only greater reward than working with them has been the satisfaction of seeing those who would harm our clients in uncomfortable handcuffs, wondering what just happened! 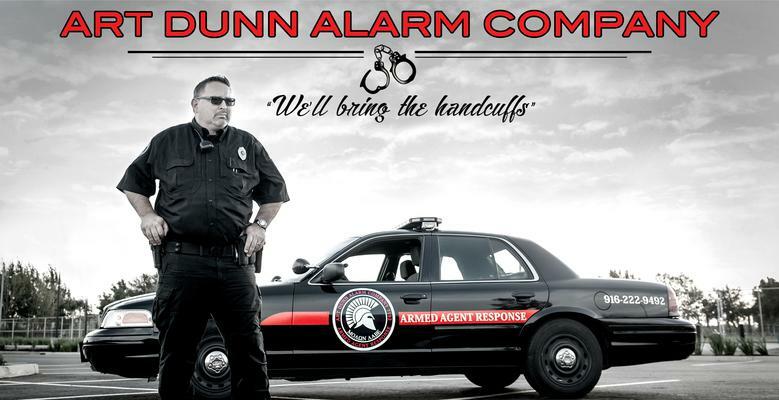 Art Dunn Alarm Company reports that it has now passed the milestone of the hundredth arrest of a criminal detected by one of their systems. The hundredth arrest was made in Turlock by Sgt. Hansbury, a patrolman for Ontel Security Services, Inc., based in Modesto. Earlier the same evening, Ontel Capt. LeDesma assisted by patrolmen from Rank Investigation & Protection Inc. had arrested two subjects at a site in Modesto. To be counted as an arrest, the subjects were either placed under citizen’s arrest by private security or at least detained by law enforcement. Contacts that resulted in warnings or “near misses” were uncounted but certainly exceeded the number of arrests. In what some criminals may consider unfair tactics, most of these arrests were made in places where criminals wouldn’t expect their activities to be detected and with nothing but pangs of conscience to warn them of consequences. “We are the specialists in outdoor and empty property detection” said Director Art Dunn, founder of the eponymous alarm company. “These arrests prove the value of our combination of detection and response”. Dunn uses video cameras that send alerts and videos directly to the computers in patrol vehicles, allowing the responding patrolman to review the videos of intruders themselves. “When you have an intruder or vandal on your property, the most important thing is getting someone out there quickly to catch them. Using these silent cameras we’re able to detect intruders while they’re still trying to decide how to get into the building, giving us that critical head start to catch them. They have no idea we’re coming to catch them, so they’re in no hurry to leave with our client’s property”. Using Videofied cameras that are completely battery powered and wirelessly connected to the internet via cell towers, Dunn formed a strategic partnership with Ontel in 2012 to offer their clients enhanced protection services. The first arrest in April was made at a bank owned property where the lack of utilities made any other technology impractical and the bad guys overconfident. These same cameras were deployed on school rooftops to address crushingly expensive vandalism of air conditioning equipment, in one instance ending a crime wave that cost one school district over one million dollars in damage at a single campus. Ontel’s Chief David J. McCann remembers the first arrest at Alice N. Stroud Elementary of a would-be copper thief as the first significant arrest because “… it proved that this solution worked where nothing else would”. Similar results have been achieved at other schools, construction sites, rooftops and empty buildings. “We’re pleased that our relationship with Art Dunn Alarm Company allows us to offer enhanced services to our customers”. California has adopted a softer stance on non-violent crime in an effort to comply with court ordered prisoner releases and voter approved proposition 47. This “catch and release” policy has strained law enforcement resources, slowing responses to lower priority crimes. Despite the fact that this has been the situation for years, victims are still regularly surprised to see trespassers and burglars released with little more than a summons to appear- essentially a parking ticket. My career has been a succession of forward steps, each one building on the education and experience of the one preceding. Following my service as an Avionics Technician in the Navy were years I spent first in the burglar alarm and later the electrical construction industries. Returning to the burglar alarm industry, I decided that my eponymous business should seek success in areas shunned or ignored by competitors. Additionally, my success would be measured in arrests and property protected rather than by monthly revenue or number of accounts. Adding my new experience of responding to alarms and arresting intruders to my decades of prior experience led to a complete rethinking of means and methods. With experience I learned what worked and what didn't. I stopped doing what didn't work and kept improving what did. I stopped focusing on offering security equipment and started offering security solutions. This new approach led to arrests and success stories our competitors still can't duplicate!